Background : What is centroid of Tree? Centroid of a Tree is a node which if removed from the tree would split it into a ‘forest’, such that any tree in the forest would have at most half the number of vertices in the original tree. Suppose there are n nodes in the tree. ‘Subtree size’ for a node is the size of the tree rooted at the node. greater than the depth of v). where ui is i'th child to v.
Let T be an undirected tree with n nodes. Choose any arbitrary node v in the tree. If v satisfies the mathematical definition for the centroid, we have our centroid. Else, we know that our mathematical inequality did not hold, and from this we conclude that there exists some u adjacent to v such that S(u) > n/2. We make that u our new v and recurse. We never revisit a node because when we decided to move away from it to a node with subtree size greater than n/2, we sort of declared that it now belongs to the component with nodes less than n/2, and we shall never find our centroid there. In any case we are moving towards the centroid. Also, there are finitely many vertices in the tree. The process must stop, and it will, at the desired vertex. Theorem: Given a tree with n nodes, the centroid alway exists. Proof: Clear from our approach to the problem that we can always find a centroid using above steps. Finding the centroid for a tree is a part of what we are trying to achieve here. We need to think how can we organize the tree into a structure that decreases the complexity for answering certain ‘type’ of queries. Make the centroids of these trees as children of the centroid which last split them. The centroid tree has depth O(lg n), and can be constructed in O(n lg n), as we can find the centroid in O(n). 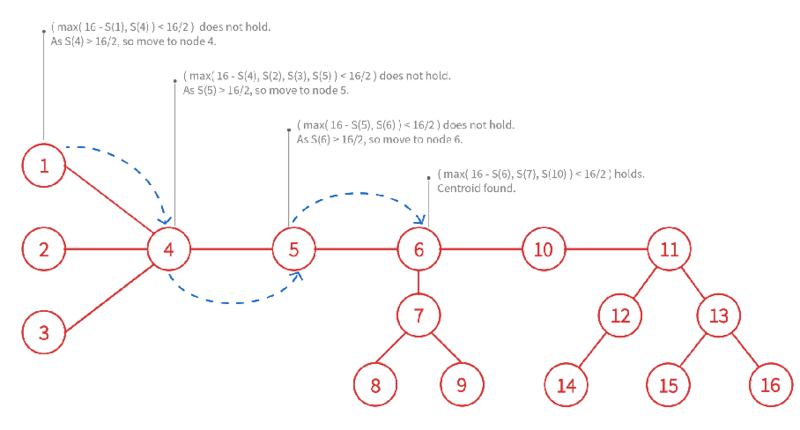 Let us consider a tree with 16 nodes. The figure has subtree sizes already set up using a DFS from node 1. We start at node 1 and see if condition for centroid holds. Remember S(v) is subtree size for v.
We make node 6 as the root of our centroid, and recurse on the 3 trees of the forest centroid split the original tree into. NOTE: In the figure, subtrees generated by a centroid have been surrounded by a dotted line of the same color as the color of centroid. We make the subsequently found centroids as the children to centroid that split them last, and obtain our centroid tree. NOTE: The trees containing only a single element have the same element as their centroid. We haven’t used color differentiation for such trees, and the leaf nodes represent them. /* function to get the centroid of tree rooted at src. We can solve above problem in O(N Log N) time using Centroid Decomposition. Perform centroid decomposition to get a "tree of subtrees"
Solve the problem for each "child tree" of the current subtree. This article is contributed by Yash Varyani. If you like GeeksforGeeks and would like to contribute, you can also write an article and mail your article to contribute@geeksforgeeks.org. See your article appearing on the GeeksforGeeks main page and help other Geeks.